Golden Gate Caravan Park is located in stunning surroundings near to Towyn in North Wales and Abergele, a small seaside town situated between Rhyl to the east and Colwyn Bay to the west. The area offers a host of attractions for tourists including leisure parks, music events, funfairs, historical castles, Snowdonia, good local pubs and an excellent array of local restaurants. Golden Gate Caravan Park Facilities and Attractions provide many reasons for choosing to purchase a caravan in this area. An extended 10.5 month season allowing for additional holiday periods, from 1 March until 14 January. With many family favourites available in our on-site Restaurant/Diner, or choose traditional fish and chips from our takeaway shop, you will not need to cook in your caravan every day. We also offer supermarket items to purchase from our site shop. 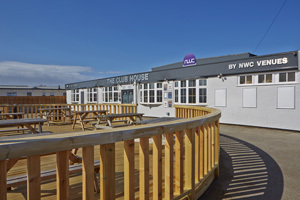 We have live entertainment shows in the Club House, an Amusement Arcade and games room to keep your teenagers busy, and an all-weather multi-sports court for many outdoor activities. The children will be spoilt for choice, with many organised events and pastimes, such as Soft Archery sessions, Body Zorbs, a Climbing Wall and Disc Golf, plus many more alternatives. During the holiday seasons, many of these activities can be pre-booked using our on-line reservation system to ensure that your child has a certain place. Golden Gate Towyn place great emphasis on your safety and security, and we offer on-site security with a 24 hour CCTV system in operation. Our on-call maintenance team are able to resolve any issues you may have with a speedy response. Holidaymakers love the Golden Gate Caravan Park facilities for many reasons; maybe because of the beautiful countryside surroundings, or possibly they may enjoy a traditional, family, seaside holiday. It is because of these reasons that so many people look for holiday homes and caravans for sale in North Wales, beginning their search in popular holiday resorts like Golden Gate Caravan Park. We are happy to help with any queries you may have; please message via our Contact Us page, by telephone on 01745 833 048 or call our Office for a chat.